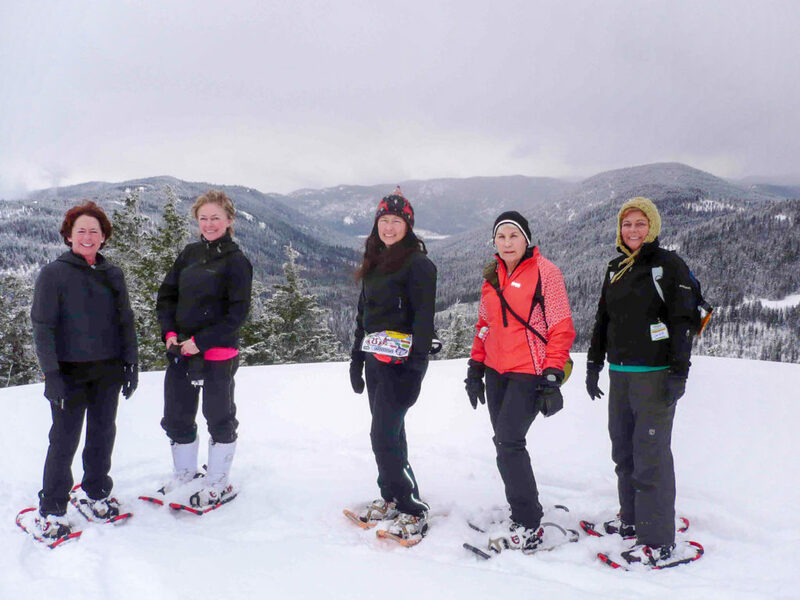 In 1,000 words (or more), here’s an introduction to snowshoeing in the Okanagan Valley. Technique: if you can walk, you can snowshoe. Your feet are generally a little wider apart so one foot is not stepping on the other foot’s snowshoe. If the snow is deep, you’ll have to raise your feet a little higher as you take each step. If the trail is packed, you can generally shuffle along. Before you go out for the first time, put them on and walk around the backyard so you get used to the feel. After you walk around for a few minutes, tighten the laces, straps or bindings but not so tight that they cut off circulation. Boots: Use insulated winter hiking boots or snowshoe boots which are designed for that purpose. Big heavy winter boots like Kamiks and Sorrels are softer, don’t have ankle support and will be more difficult to walk in, especially on longer trails. Likewise, suburban boots – the kind you wear on a snowy day to the mall – are not going to be comfortable after a few kilometres. The second general rule is: the softer the snow, the larger the snowshoes. On packed trails, like those at the ski resorts and downhill areas, you can get away with small snowshoes. If you are planning to go off-trail, you’ll need larger ones. If you didn’t bring the larger ones, the person with the largest ones should break trail. Clothing: It may be mid-winter but you’re going to be working so layer, layer, layer. Wicking materials like polypropylene underwear are the only way to go with fleece on top of that and a waterproof, windproof outside layer. Waterproof pants or snowpants are a must because you’re going to get wet, either from falling or snow flipping up from the tails of your snowshoes (because you haven’t learned to keep your tips up yet). Gaiters to protect your legs from the shin to the ankle are good. Blue jeans are not. They don’t protect against the cold, often get wet and don’t dry until you’re back inside. Waterproof gloves with an elastic cuff will keep your hands dry but bring a pair of chemical hand warmers in case they get cold. Leave the hand warmers in an inside jacket pocket for the next trip if you don’t use them. Those who get cold hands should use mitts. A toque or warm hat are recommended. A small backpack can carry water, snacks, lunch, hand warmers, sunglasses, lip balm, a second pair of dry gloves and clothes you want to shed after starting to sweat. It’s highly recommended you use that backpack or get a sports bag to carry everything you need so you don’t forget something critical like your gloves or hat. Poles: Highly recommended but make sure they have as large a basket as possible. Cross-country ski poles with small plastic baskets will sink right into the snow and not provide much support. Poles not only help beginners maintain their balance (spread your arms a little wider at first) but are useful when climbing over fallen logs, pushing you uphill or slowing your descent. If you swing them, the person behind you who keeps stepping on your tails will back off or pay the price. Where: If you are just starting out, don’t go for a six-hour hike in the middle of nowhere without a compass, GPS or map. Instead, go to one of the cross-country ski areas or a downhill resort with established trails that are packed, marked and distances are listed on a map. Start shorter and build up your strength for the all-day treks into virgin territory. Go with someone who knows how to snowshoe, knows the trails and knows how much exercise you can take the first time out. And even better, someone who knows the history of the area and brings hot chocolate, cookies or other treats to be dipped in melted chocolate around a roaring campfire. One of those guide-naturalists is Roseanne Van Ee of Outdoor Discoveries in Vernon. Her snowshoe tours on Silver Star Mountain have started earlier than ever because of early-season snow. New this year: her Snowshoe Safaris and Sunset Adventures are almost every day; the Ladies Day Snowshoe Tour and Lunch has become so popular that they are every Tuesday; the Starlight Cabin Rendezvous snowshoe-dinner tour and Chocolate Dreams are available every night. And there’s a once-in-a-lifetime event this year: The Wild Horseman’s Adventure on New Year’s Eve coincides with a blue moon. The next time it happens under a blue moon is 2048. Those who have ‘been there, done that’ are already booking for the popular, romantic outdoor adventure on Valentine’s Day called: Sweethearts Chocolate Dreams. By the way, Van Ee has 24 pairs of used snowshoes for a Brownies, Cubs or another youth group for sale. They are designed for group use with universal sizing, rubber harnesses, are maintenance-free, easy to store and almost like new. Phone 250-545-7446 if interested. 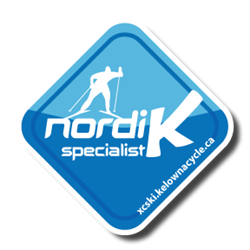 At Kelowna Nordic Cross-Country Ski Club, snowshoe guru Rick Gee usually has his regular hikes on the website. Telemark now has almost 40 kilometers of trails, “probably the most varied and scenic terrain in the Okanagan,” said Krar. There are new snowshoe trail maps with descriptions on the website. Daily trail passes are $7; a three-hour rental $10; and a season pass $60. At Sovereign Lake Nordic Centre (www.sovereignlake.com), Trish Gobeil is the snowshoe coordinator. Nickel Plate Nordic Centre is also planning weekly snowshoe outings this winter, possibly every Tuesday.